Photo courtesy of Wikimedia Valerio Bruscianelli This file is licensed under the Creative Commons Attribution-Share Alike 4.0 International, 3.0 Unported, 2.5 Generic, 2.0 Generic and 1.0 Generic license. The story of Neuschwanstein Castle (pronounced “Noy-shvahn-shtine”) is one of great artistic appreciation and support of the arts, of tragic allegiances, lost power, escape from reality and mysterious death - and of how the Crown Prince of Bavaria followed his father in believing himself to be in direct lineage with the Knights of Schwangau - who held the Swan as their heraldic creature. It is also the story of how the legendary character of Lohengrin, the Swan King around whom Wagner wrote the opera of the same name, inspired the Crown Prince. When he became King, Ludwig II saw himself as a personification of the myth – and this added to his inner conflict in his battle to conform to expectations of family, church and nation. It is a fairy tale story of a castle now known worldwide for its storybook image – thought to be the inspiration for the design of the Sleeping Beauty’s castle in Disneyland – and which appears on the 1€ coin minted in 2012. 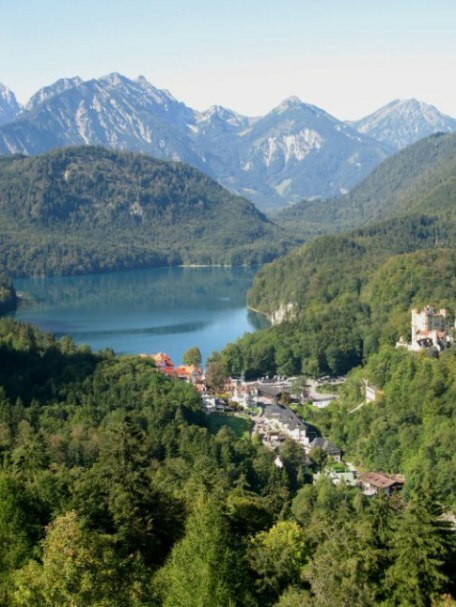 But this is a fairytale whose only happy ending has been for the millions who have shared the fantastic dream of King Ludwig II by touring Neuschwanstein Castle – and for the Bavarian State which benefits from the massive economic impact of the constant tourism. The story of Neuschwanstein Castle is also a fairytale that cannot be told without the story of the relationship between King Ludwig II and the great composer, Richard Wagner, whose Lohengrin Opera, viewed by the young Ludwig in Munich in February 1861, forever changed his future. To have some idea of why Crown Prince Ludwig II was, as the German’s would say ‘begeistert ’ – enthralled – click on the links below to the exquisite music of ‘Lohengrin’. This is the introduction to the first Act but most of us are more familiar with the section called "Elsa's procession to the Chapel" - or what is usually called simply: ‘The Wedding March’. Let the music play as you read the page on Neuschwanstein, viewing its magic for yourself in the context of its creation – music and fantasy to stir the heart. As I was to explore the stuff of fairy tales, it seemed appropriate that my first view of Neuschwanstein Castle was at dusk. 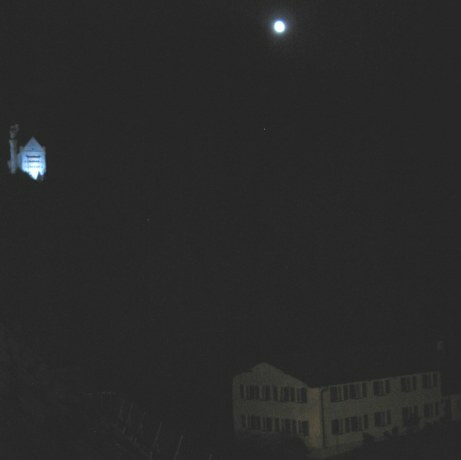 There it rested atop its granite crag under a full moon – a ghostly start to a ghostly tale. 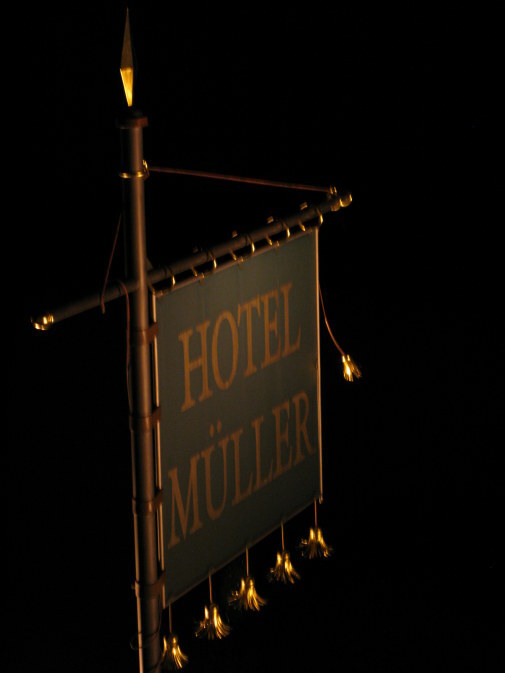 I took the photo by hanging out of the bedroom window above the hotel sign, that itself glistened golden in the twilight. Be aware that the queues for tickets get longer as the day progresses, and there is only one place they can be purchased – at the Hohenschwangau ticket office beside Hotel Müller. To put the queue in context, over 1.3 million people from all over the world visit Neuschwanstein every year – and up to 6,000 a day in summer. Many come in groups with pre-purchased tickets – but there are many more who arrive without. You will meet people of every nationality as you queue, so it is a place to be relaxed and chatty rather than develop 'waiting in line frustration'. 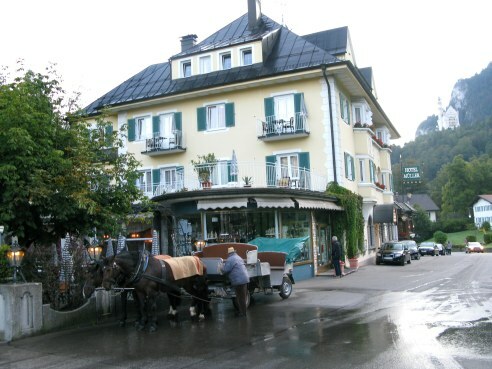 In Hohenschwangau, the horse-drawn carriages all line up before the Hotel Müller - and the first carriage was ours. The Bavarian Coach Horses under their blankets looked as if they were still waking up as they stood waiting for that first heavy ride up the steep mountain . 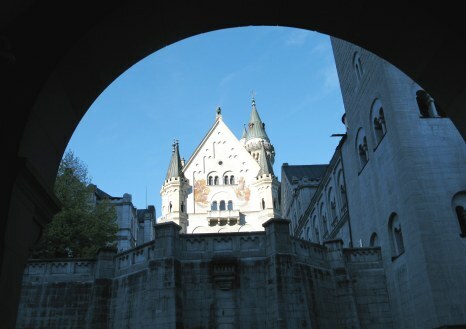 Above us, Neuschwanstein beckoned in clear pale blue morning stillness broken only by the steady sound of hoofs as the patient beasts carried us upwards, just as when the castle was opened to the public in 1866. 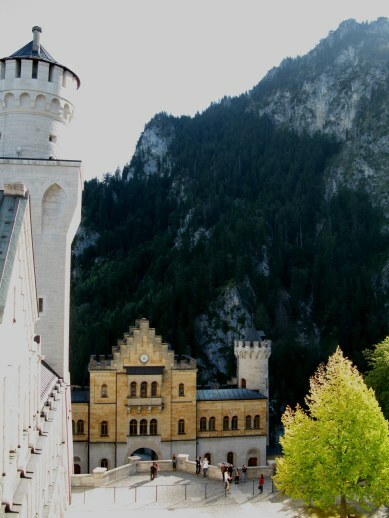 It was a good plan to take the first morning carriage to Neuschwanstein Castle. After our tour, we were on our way down when the rest of 'the world and his wife' were on their way up. An early start can also be by the 10 minute bus ride to the Marienbrücke, or by foot – a walk which will take you about 20 minutes (if you are fit). 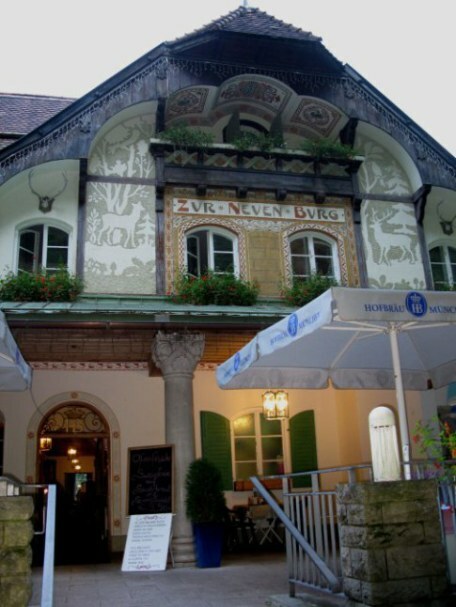 Once at the top of the climb to Neuschwanstein Castle you can stop for refreshments at the Zur-Neuen-Burg restaurant, or just stop at the little take-away stand out the front and buy some Berliner-ballen - more commonly just called ‘Berliner’. These delicious little custard-filled donut balls (similar products are known in Canada and parts of the USA as ‘Bismarcks’) were the source of much merriment within Germany when John F Kennedy visited Berlin. Fortunately, Germans appreciated the intent in the famous end to Kennedy’s address. Everyone understood that he meant to show his empathy with the people of Berlin by saying he was one of them: ‘Ich bin ein Berliner’ – but he could have been saying he was a donut-ball. The last of the Knights of Schwangau died in the 16th century, but the legend of the Swan Knight was painted into the young prince’s life – as was the imprint of the heraldic swan. 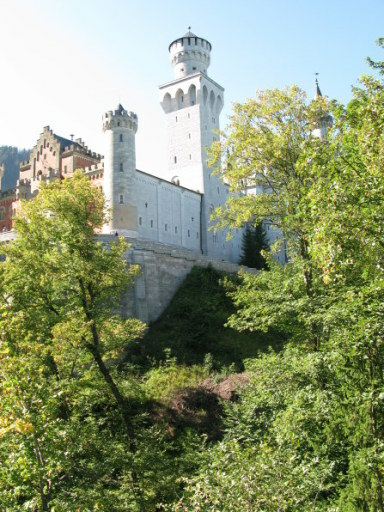 Both appear throughout Hohenschwangau Castle, the castle lower down the mountain from Neuschwanstein where Ludwig II and his brother spent much time in their youth. 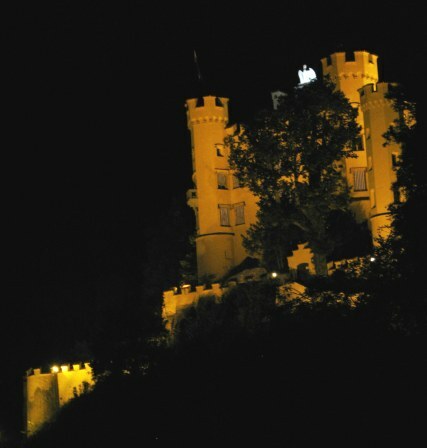 The imagery was to be recurrent within Ludwig’s own castle. Here is some more music of Wagner’s ‘Lohengrin’, the opera of the same name about the Swan Knight, protector of the Grail, who was sent in a boat pulled by swans to rescue the maiden Elsa. Play it here to form the background to enjoy as you read. Its poignancy adds to the tragic setting of the story of the King, his castle and the composer who inspired him. This is a beautiful rendition of Lohengrin’s introduction of himself to Elsa - explaining why she should not have asked his name. It is sung with precise and eloquent German lyricism by Jonas Kaufman – and even if you are not an opera fan – try just listening to some inspiring music. This is the translation of the lyrics from below a posting on UTube. are bestowed by it on its votaries. 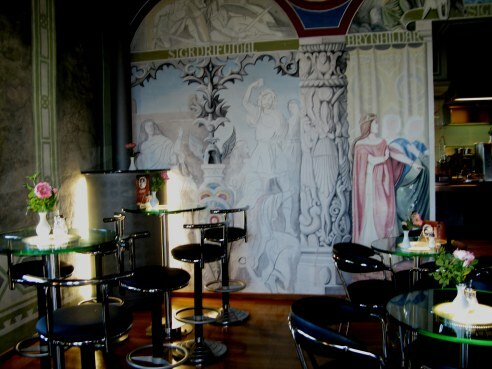 These scenes to match the story of the tragedy of Lohengrin, The Swan King, were painted onto the walls of the Neuschwanstein castle cafeteria especially for a film production. 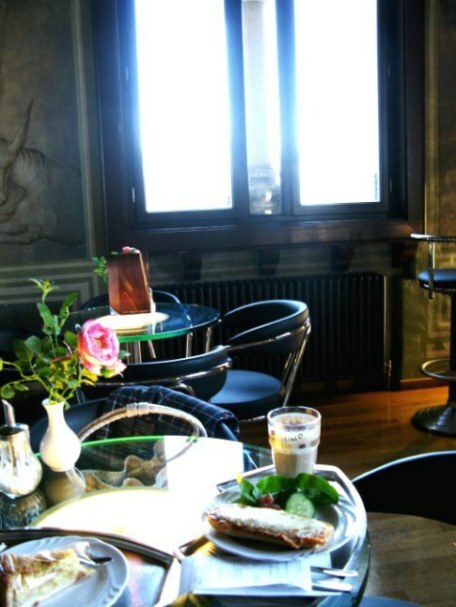 It is a lovely café with good quality, tasty food – and a marvelous outlook. 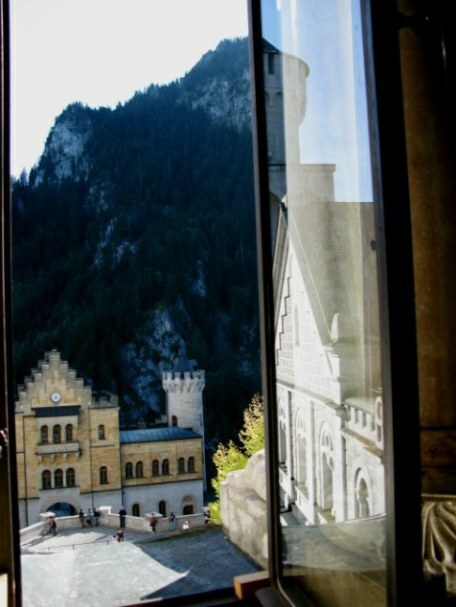 The views from the terrace beside it make you understand the brilliance of Ludwig – and all who brought alive the dream to have a magical castle environment at Neuschwanstein to frame the spectacular vistas. Standing at the gate to the castle, it looms majestically above you. Once inside the courtyard, electronic displays show the times of each tour, in which language, and by the number that corresponds to that of your ticket. Ludwig II, born Ludwig Otto Friedrich Wilhelm, was the son and heir born on the feast day of St Louis, the patron saint of Bavaria, to Maximilian II of the House of Wittlesbach ( who was still Crown Prince at the time), and to Princess Marie of Prussia, to whom the Crown Prince was later to bear a striking resemblance. After the early and sudden death of her husband and her son’s succession to the throne at the age of 18, Marie would become dearly loved by the people of Bavaria for her charitable work on behalf of the common man. Among her many benevolences, together with her son the new king, who perhaps reflected more of her temperament than that of his stern father, Marie reactivated a league to support and provide for wounded soldiers. This was the basis from which the Red Cross of Bavaria was formed – and the Red Cross we know later took over their activities. 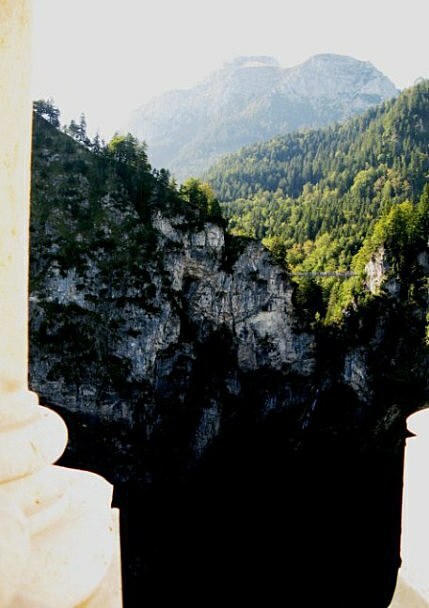 This is the 'Marienbrücke' (Marie’s Bridge) to which you can now travel by bus from Hohenschwangau, and from where spectacular views of Neuschwanstein Castle can be had. Perhaps it was from here that Ludwig was inspired to select the location of Neuschwanstein, for on the site already stood ruins of a former castle. Looking upwards from this castle terrace, these are some of the small details that make Neuschwanstein so spectacular: faces carved into the ends of the support beams for the terrace above. On assuming the throne, the eighteen year old Ludwig was sincerely devoted to his people. He had grand ambitions for his role as their sovereign, apparently hoping to strengthen the relationship of Bavaria with the rest of the German Empire. His people, in return, were captivated by their tall, good-looking new regent. His marriage was arranged to Duchess Sophie of Bavaria – but was delayed by Ludwig – and finally cancelled altogether. Ludwig sent genuinely apologetic letters to the aggrieved bride-to-be. Sophie later married Ferdinand d'Orléans the Duke of Alençon, but remained friends with her former fiancé. A devout Catholic, Ludwig records in his diary his anguish at his relationships with men – and it has been much speculated that this, plus his inability, or at best his reluctance to handle the affairs of state during the dangerous years of Prussian dominance, were what threw his kingship into disrepute with government. Bavaria held a close relationship with Austria as part of the Austro-Hungarian Empire. When Austria declared war on Prussia, the rest of the German states declined to join – but Ludwig had a previously contracted obligation to send his troops to support the alliance. It was a disaster for Bavaria when Prussia was victorious – and under the terms of the ensuing peace treaty, Ludwig was stripped of his rights as sovereign of his own country, retaining merely a nominal status of King. He didn't attend the signing of the treaty, sending his brother Otto instead. Now, Ludwig's focus turned to rescuing the composer Wagner from his debtors and acting as his benefactor. 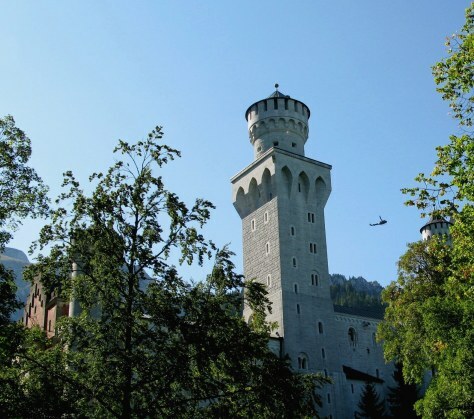 Ludwig now retired to the family mountain retreat – Hohenschwangau Castle. Here he planned a great era of castle building – financed not, as some people have claimed, from the funds of state, but from his own substantial family financial reserves. However, even these were soon exceeded, and his efforts to redress his debts by pursuit of loans from the noble families of Europe became increasingly hopeless. 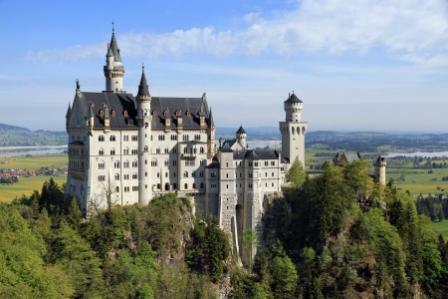 Neuschwanstein was designed as a great tribute reflecting the themes of Wagnerian opera. In his support of the composer, we are also indebted to Ludwig II for financing ‘The Ring’ and ‘Parsifal’. He resolved Wagner’s debts so he could continue composing and instituted the concert hall of Bayreuth and its Wagner concerts. 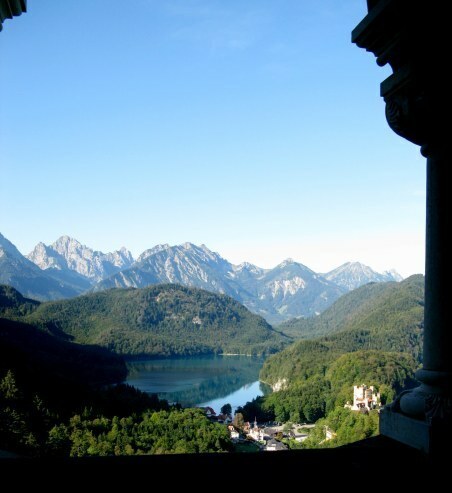 Installed in Hohenschwangau Castle, Ludwig was able to watch the progress, slower than he had hoped, of the construction of Neuschwanstein Castle, which owes its beautiful design to a set designer for theatre – Christian Jank. The architects with the task of making this fantasy tangible as a Romanesque Castle were first Eduard Riedel, then Georg Dollman and finally Julius Hofmann – over a period of 23 years. Eight metres of stone (about 26 feet) had to be removed before the foundations could be secured. 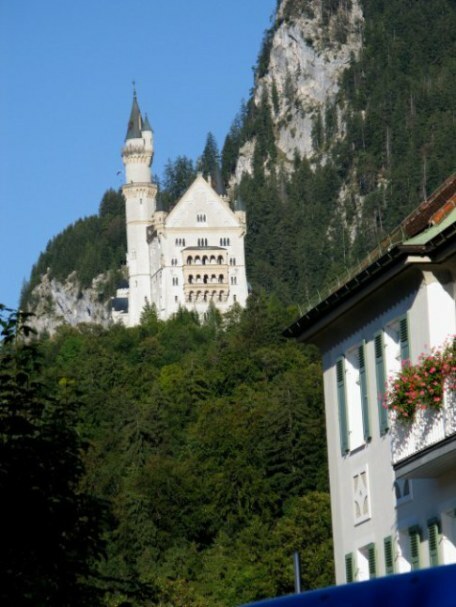 Although appearing ancient, mystical, and ethereal on its mountain perch, Neuschwanstein had many modern conveniences. ...complete with a turbine driven roasting spit. 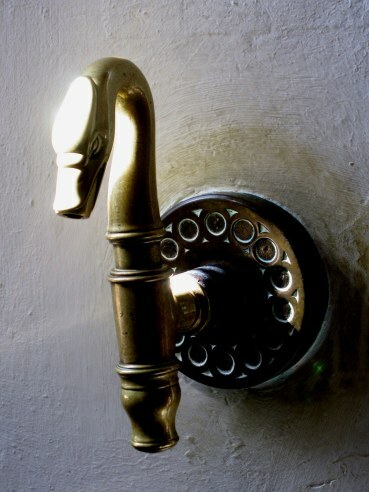 Even in the kitchen, the swan image prevails – here as the tap spigot. 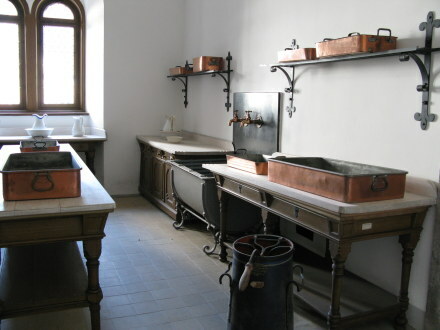 The washing-up room is separate. 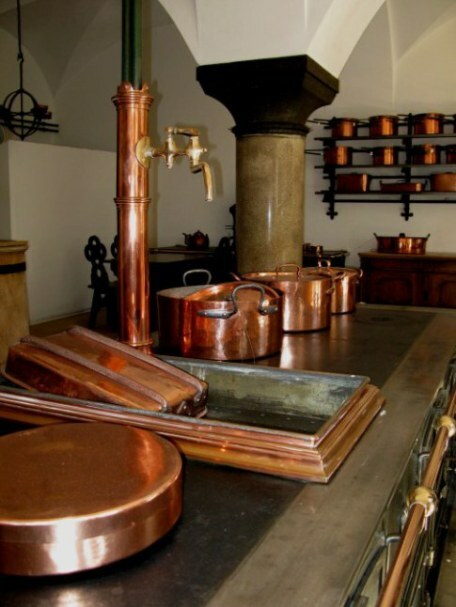 You pass the kitchen and service area on the way out of the castle, but from above can look down into the courtyard and at the citadel at the entrance, which was the first part of the castle to be completed. 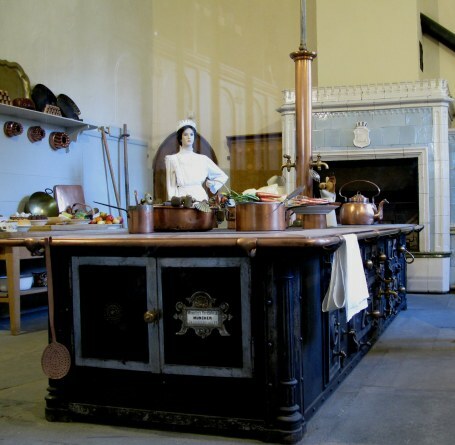 Although you are not permitted to take photos inside the castle rooms apart from the scullery and kitchen, it is allowable to take photos from the windows. The Bavarian landscape at its most picturesque is set out here before you, as poetic and lovely as the castle it inspired. 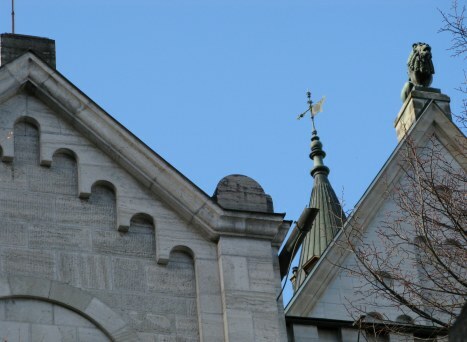 Here the Holy Mother stands on a small ledge framing the view, so one could probably do one’s devotions to the backdrop of God’s great church – the outdoors. When I took these pictures it was one of those perfect days where the world seems to holding its breath as it awaits the first frost. In this context, the views were like perfect images of a land you dreamed of once-upon-a-time, now come alive from the storybooks of your childhood. 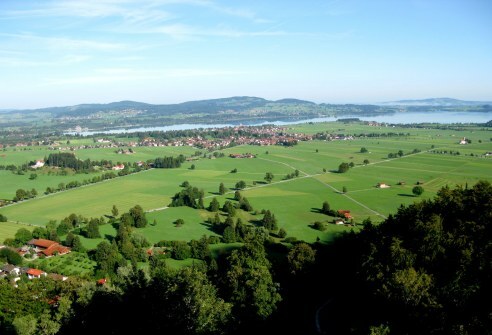 The town of Hohenschwangau below seemed carved into the countryside at the foot of both castles. 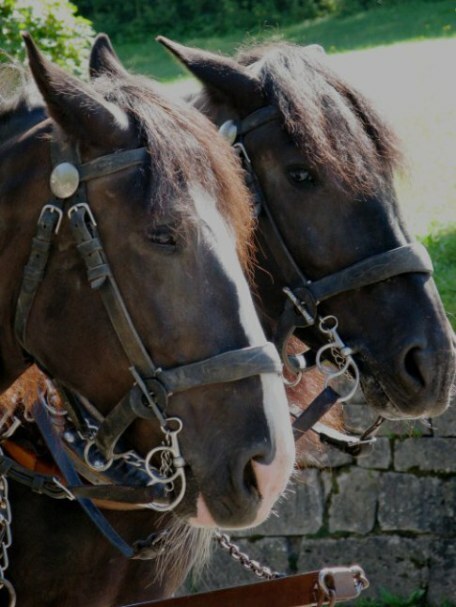 ..but our horses paused only for essential toilet stops – announced jovially by the carriage driver. 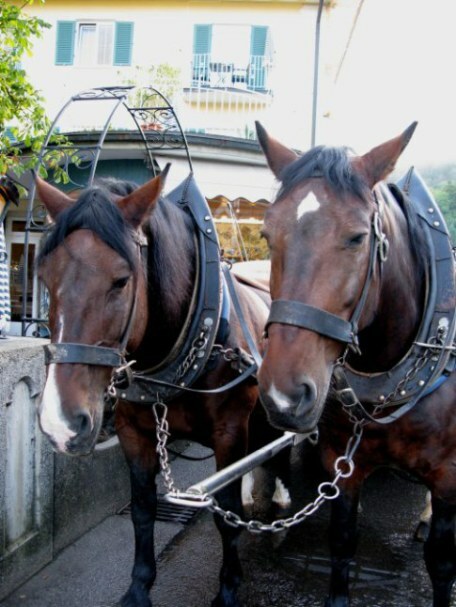 The carriages are pulled by what our coach driver called ‘Bavarian Coach Horses’ – a breed generally thought to be a handsomer version of the English Cart horse. Probably the most famous stallion of the breed was Hannibal – a magnificent beast who won the award for Grand Champion Stallion (in other words including all breeds) at the 1903 St Louis World’s Fair in America. 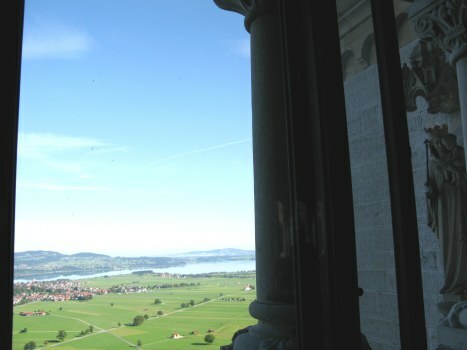 The views of Neuschwanstein with which most people are familiar are reputedly only able to be gained by helicopter or glider. Some lucky people were getting just that view from a helicopter as we plodded away aboard our carriage. 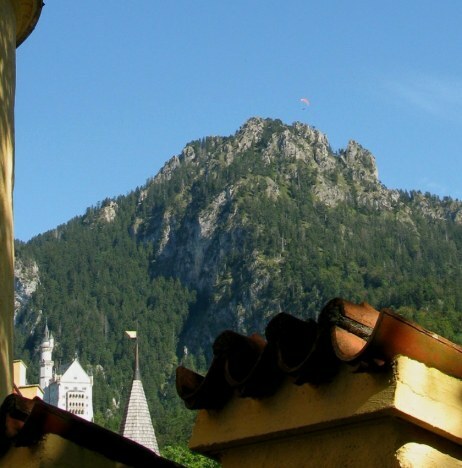 Later, from Hohenschwangau Castle I saw that there was another way to get this view – if you were fearless – as a paraglider swooped down from the mountain top through the cold blueness towards Neuschwanstein. 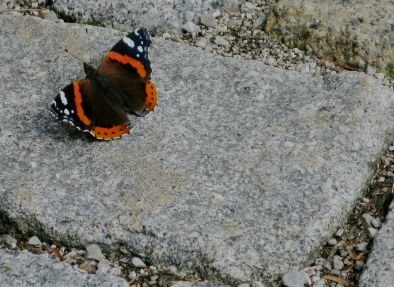 Also at Hohenschwangau, I was to note that some of those who flew in were more colourful than others. An appropriately named ‘Monarch’ butterfly rested in the courtyard of Bavaria’s monarchy. I wondered if Ludwig had also enjoyed watching the butterfly visitors. It was no wonder that in his isolation, and as King – even just in title – he reacted violently against the envoys sent to advise him he was to relinquish his position as sovereign. 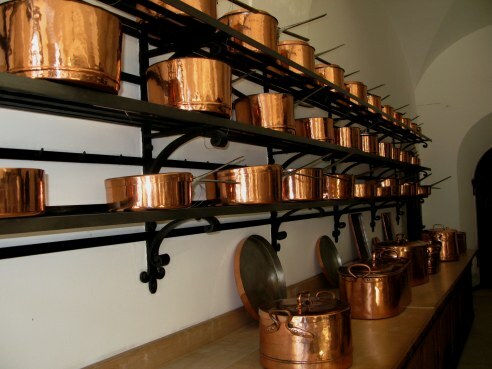 He apparently had them seized and locked up, only to be released by sympathetic servants. Since much of the testimony that was used as evidence against Ludwig came from his staff, this is understandable. Apparently Ludwig advised servants to run and hide if they saw him coming – and if they could not do so, to stand stock-still and lower their eyes. If that is the grounds for insanity, there are some high ranking national leaders of this era who have instructed their security staff in a similar fashion – so possibly they would also qualify! At any rate, for reasons much speculated upon, but certainly with provocation from Ludwig’s scant attention to the duties of his position, the politicians of the time moved to depose their king. Apparently the final action to do so was prompted from his most trusted servant who instead of giving a letter entrusted to him for Sun King Louis of France instead to German authorities. In it, there was agreement to keep Bavaria out of a future war in return for a sizeable personal loan to Ludwig - or so it is held. The thing we do know as fact are that Ludwig II was declared incurably insane by a psychiatrist who had never met him, let alone examined him. Once detained and imprisoned, he nonetheless retained his title. Therefore on death, like all his ancestors from the 17th century onwards, his heart was removed and placed in a silver urn in Altoetting Chapel. Ludwig’s uncle, Prince Luitpold, became Prince Regent of Bavaria, acting as defacto King when Ludwig was deposed and his much-loved brother Otto was pronounced insane and confined until his death – although also keeping his title and hereditary rights – and having his heart also removed to Altoetting. Whether Ludwig was insane, or merely eccentric, is a matter of much debate. Throughout his life, Ludwig had been close friends with his cousin, Empress Elisabeth of Austria, known as ‘Sissi’. Sissi knew only too well the tribulations of royalty. A free-spirited young woman, she caught the eye and heart of the Emperor Franz Josef, who had been bethrothed to her sister by his demanding mother, Princess Sophie of Bavaria. Franz Josef stated he would marry Sissi or no one, and only by thus forcing the hand of his ambitious mother was he able to marry the young Duchess Elisabeth Amalie Eugenie of Bavaria. However, his mother dominated the life of the spirited girl – reputedly even taking her first three children away from her at birth, not even allowing her that important first bonding of mother and child. Sissi’s sensitive nature, like that of her cousin Ludwig, was more given to poetry, the arts, and the outdoors than to strict court protocol. Sissi was an accomplished horsewoman and had a bright and curious mind. Finding the reputedly two hour hairdressing of her floor-length hair tedious, she employed a Greek tutor to teach her Greek. The extra language added to the German, French, and Hungarian that she already spoke. Her ability to speak hungarian was pivotal in securing the continuity of the Austro-Hungarian Empire of which her husband was finally crowned King. Sissi spent a great deal of time in Hungary and the only child she was able to keep, a daughter, Marie Valerie. Later in life, her only son, Rudolf, died at what is generally termed ‘the incident at Mayerling’ – in what appeared to be a murder suicide with his lover. Sissi was heart-broken and reportedly never recovered from the loss. From the realities of her apparent fairytale princess existence – which was anything but so - Sissi escaped into travel and a regime of what would now be called anorexia nervosa. Bouts of violent illness were triggered by her return to the court where she felt confined. Ludwig escaped to the mountains and his Wagnerian fantasies. "The King was not mad, he was just an eccentric living in a world of dreams. The manner of his death is curious. 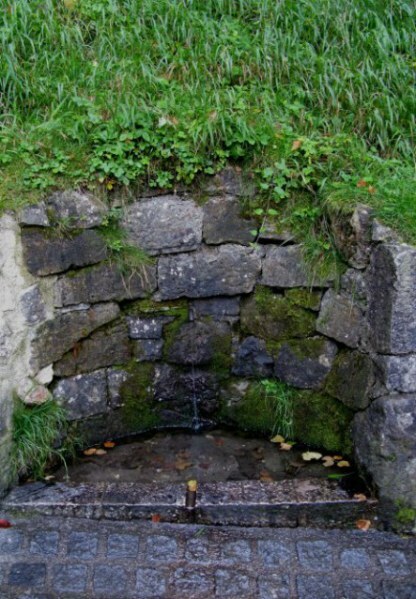 After being deposed and imprisoned at Castle Berg, two mornings later King Ludwig II was found dead in the shallow water of the lake together with the same psychologist who had been his undoing. The two mysterious deaths were officially explained as 'drownings' although later two independent parties claimed he had been shot in the back – one showing what was reputed to have been Ludwig’s jacket as evidence. Sissi herself was stabbed to death by an Italian anarchist who was seeking any member of royalty to murder as a statement against the monarchy. 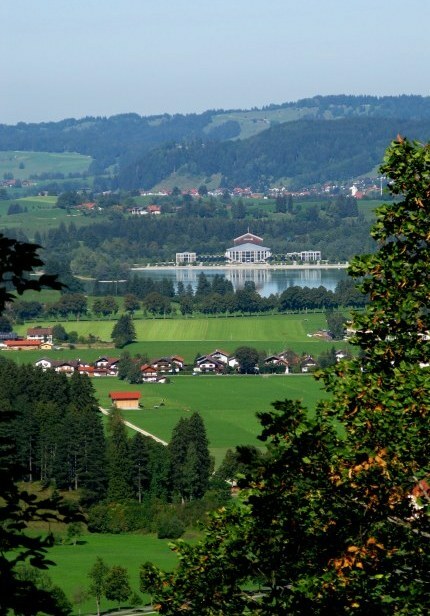 In accordance with Bavarian tradition, the hearts of the royal family are interred in silver urns in the Gnadenkapelle (Chapel of Mercy) in Altötting, and Sissi's heart lies there with that of her tragic cousin. As I soaked in all the details of Neuschwanstein and reflected on its history I was struck by the tragic end to two fairy stories. Who says who is mad – and why? 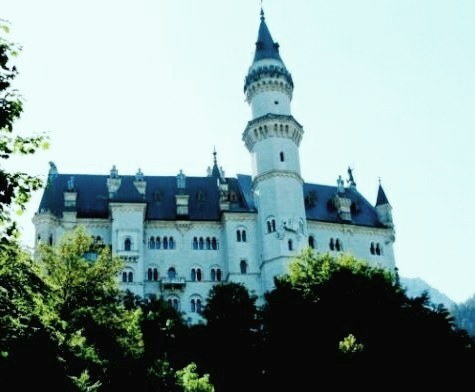 Ludwig – sane or not – left the world a legacy that would sustain his dream through his wonderful castle of Neuschwanstein. Unfortunately, he died eight years before it was finally finished. Inspired madness has left the world many marvelous things – and how mad is a person who champions, and is inspired by, music such as Wagner's beautiful 'Lohengrin'?